Starring GERALD the gentleman juggler – Precise, short tempered and vain. WALLACE the circus trainee – Inexperienced, irreverent and child like. From curtain up there is trouble. When Gerald’s juggling partner walks out on him, he asks the agency to find a suitable replacement. Enter Wallace – cue chaos. With Wallace around, Gerald will need all his years of show business experience to keep the show on track. Duration 75 minutes straight through or 45 minute first half, interval, followed by 30 minute second half. 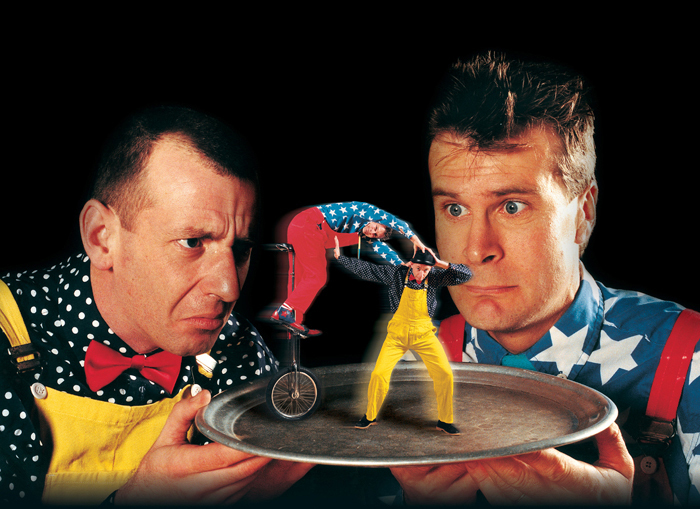 Komedy of Errors is packed with chaotic clowning, dazzling juggling, unique unicycling, mindboggling magic and audience participation, with a hint of danger. They are also suitable for ALL the family. Circus Berzercus are a partnership company whose aims are:-To create accessible quality family entertainment using the traditions of circus clowning and variety in a modern context.